Two factors that you should be carefully considering are your choice of a medical professional, and establishing the right expectations for the procedure you’re interested in. Indianhealthguru can help you with both through our before and after photo galleries. These photo galleries allow you to view actual patients who have undergone a wide variety of dental surgery procedures. "I would like to say thank you Indian Health Guru Consultants to guiding me trough my first dental treatment in India. In the first instance I was hesitating to have dental treatment in India. I visited 2 different dental practices in the UK and I was quoted between 25000 pounds. Then I started to research for other options on Internet. Amongst many offers Indian Health Guru Consultants seemed to provide the most suitable and professional package for me, which included a lovely hotel in the middle of City; taking less than 2 hours to get there. 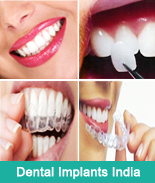 The dental clinic was located near the hotel and has the latest technical equipment and the most professional staff. At the end I had 6 implants, 2 additional crowns, a surgical extraction and bone graft plus 9 filling. My total cost including travel and accommodation was 5550 pound making a saving of min. 18000 pound. And I also had the opportunity to visit some of India’s lovely historical sites and the use of the hotel's other facilities. I can highly recommend to anyone thinking of having dental treatment of contacting Indian Health Guru Consultants." Thank you again Dr Dheeraj Bojwani. I came across Indian Health Guru Consultants on the Internet. The website was extremely professional and helpful and I found that all of my questions about Dental Implants and the procedures were answered in detail and with description. After making first contact with them I found that any questions I had were answered quickly and in-depth by Dheeraj Bojwani. Making a decision to have this surgery in India and with Indian Health Guru Consultants was made easy with the staff friendly and professional manner. The difference in price was also an important factor. The same procedure in Japan was going to cost me $ 50,000 compared to the $ 9,000 I paid in India. On arrival at the centre I was impressed with the Doctors, equipment and the amazing warmth from the staff. I felt more of a guest than a patient. My visit to India; the sightseeing and cultural experiences were shaped by the people from Indian Health Guru Consultants and I can not express my thanks and appreciation to everyone involved for making everything so unbelievably easy for me.